Lovely scenery in South Styria. I’ve visited many wine regions around the world, from the Yarra Valley in Victoria, Australia to Stellenbosch in South Africa, and Tuscany in Italy to the Napa Valley in California. One wine region I recently visited turned out to be a wonderful surprise: South Styria in the southeastern corner of Austria, about a two-hour drive south of Vienna and less than an hour from Graz. 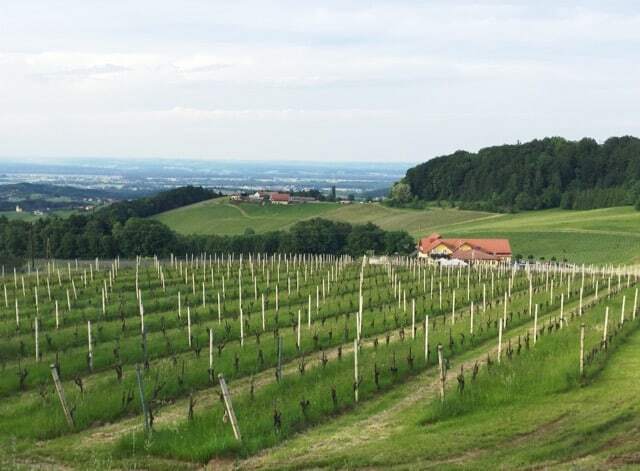 The region is characterised by gentle, rolling hills covered with row after row of vines, and patches of forests. In between, there are picturesque villages, cozy inns and lovely wine taverns. I must admit that I hadn’t heard of South Styria before my visit but after several days there, I was convinced: this is one gorgeous wine region you should know about! The fabulous wines and food, cozy accommodations, beautiful villages and gorgeous landscapes make the South Styrian Wine Road a delight to explore. Furthermore, the Wein Taxi (wine taxi) ensures that you get around the region safely, especially when you’ve been out wine-tasting! I dropped by the Rebenhof Winery for a glass of wine and a bite of its delicious flammkuchen! If you’re the more active type, you could hire a bicycle or an e-bike to explore the hilly region or hike along one of the many paths that criss-cross the region. Along the way, drop by at one of the many buschenschanks (wine tavern). These taverns are popular with locals and visitors alike who drop by for some wine and food (mostly cheese, meat and vegetable platters; no hot meals are served at these taverns). The taverns are a great place to mingle with the friendly locals – some even offer simple accommodation for visitors. The Ratscher Landhaus, one place I can definitely recommend to stay, eat and drink! Read more about my visit to the South Styrian Wine Road. Or visit the South Styrian Wine Road tourist website. Note: my trip to South Styria was part of the #AustrianTime campaign organised by iambassador with the Austrian National Tourist Office. As always, all views mentioned above are mine, and mine only.